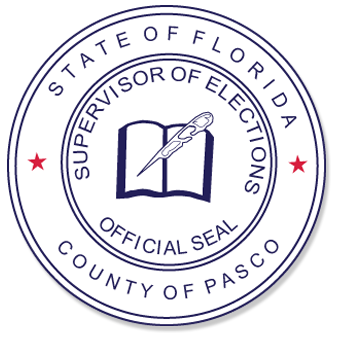 A qualified voter may vote in person at various locations throughout Pasco County, during the 11 day period prior to the General Election. The voter must present both picture and signature identification. A valid Florida driver license or identification card will meet those requirements. To avoid lines and vote from the convenience of your home, you may request a Vote-by-Mail ballot. Call the elections' office at 800-851-8754, or use our online request form at least six (6) days prior to the election for your ballot. Requests must include the voter’s date of birth and address. Be sure to call early enough so there is time for you to receive your ballot and return it by mail. Polls are open from 7:00 a.m. until 7:00 p.m. on Election Day. Remember to bring your photo and signature identification when you go to vote.